Joe Scott is a major developer and contractor in the Merrimack River Valley, and also an acclaimed author. His first book, The Joe Dial, received glowing reviews for its perceptive take on human interaction, and the role of positive and negative energy in relationships. His new series, The Friend Ship Friendesha, introduces many of the same lessons to children ages 4-8. 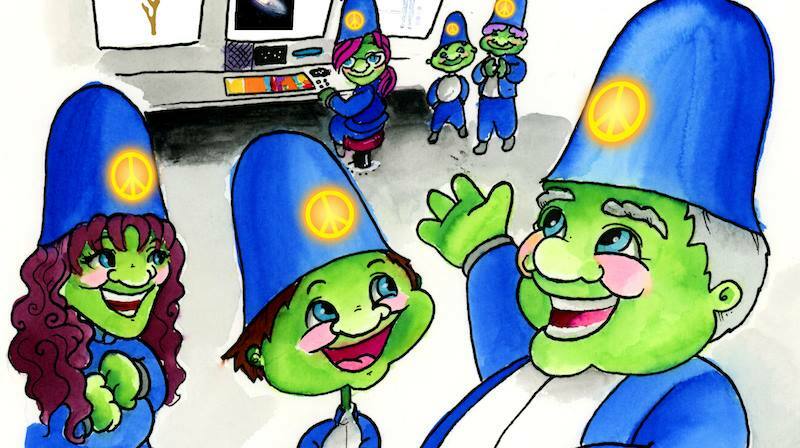 With bright, bold illustrations by local artist R. Boone, and delightful characters, the new story is sure to be a hit with young ones and their parents, as the lovable extra-terrestrial race of Friendeshans spread happiness and positive energy around the galaxy. Joe is a powerhouse of positive energy, with a perpetual chuckle that is only interrupted by booming laughs. I spoke with him in Newburyport, at the mouth of the Merrimack River, along which he has lived and worked nearly his whole life. The following Q&A is what transpired. Could you tell me a little about your childhood and how it shaped your career, as a contractor and author? In my first book, The Joe Dial, there’s a “Ladder of Life, and on it, there’s a positive side and a negative side. People are born either positive or negative. They just come out that way. Then, of course, besides the DNA, there is the way you are raised. I was lucky, in one sense, because I had a father that was positive, although I had a mother that was negative.I was taken to work by my father at a very young age, in construction. Anytime he was doing some work in the trades he either had to hire someone or use my hands. So oftentimes, after school, weekends, and certainly during the summers, we would go to work together.Growing up in this kind of environment – watching contractors and customers interact, and negotiate with families, husbands, wives – there was a lot of positive and negative.So as a young kid I had a different upbringing, living in the lower-middle class and working in construction rather than sports.While most kids were going to a toy store, and looking for toys, my greatest moments were going into a hardware store, and picking a nice shiny saw out, or a pair of pliers, or screwdrivers, chisels, or stuff like that. Those were my happier days. I was really a happy kid. Sometimes we’d drive, my father and I, an hour and a half together in the truck, from Vermont and New Hampshire, Massachusetts, to Connecticut. We’d get to talk, and I really liked a lot of what he was saying. He was a positive guy. That influenced me a great deal. It formed the way I treated people, always, in the construction industry, and that in turn, gave me the material to write about. So now that you've grown up, and become a hugely successful contractor, how does that affect your writing? With these stories I thought about my grandchildren, and thought about having a place to put things that happen to you, instead of having this fear and anxiety. I wanted to give them a way to think of the bad things that might be happening in another kid’s life. Whether that’s parents that aren’t around, or not making them feel loved, or any other issue. That’s where the concept of the Oily Spoilies came from. I wanted to be able to use a child’s imagination to be help think about how there is another reason that someone, a classmate, might be acting mad, bad, or sad. In advance of being able to understand a bad family life. A kid can understand these stories better than trying to explain that a classmate has parents that treat them poorly. The philosophy behind the whole thing is that I can help a kid use his or her imagination to come up with answers to why someone is mean to them, and deal with it in a positive way. Bullying is such a big theme in the book. Can you tell me why it so important to you personally? Fortunately, I was working in construction with my father, and I would punch and caulk windows. I had this old Whitney Punch, and I had to punch fifteen holes in each window, and then squeeze the caulk gun too, to caulk the window. My hands were so strong, that I could probably break your hand by the time I was ten years old. So I was a tough kid, but I’d see a lot of smaller kids get bullied, and even then, it rubbed me the wrong way. There was this one kid, that really got to me, when I was fifteen, sixteen years old, and he slower, you know, challenged. Our fathers were friends, and I would defend that kid all the time. I didn’t want the bullies to get to him, you know? I used to get in more fights as a kid, trying to stick up for these kids. (Laughs) I’ve had my shirt ripped off me, I have a broken nose. I was a tough kid, and I was never really afraid, but I saw a lot of kids that were afraid. They can’t eat, they can’t sleep, they can’t concentrate in class. Today, it’s changed, with computers and Facebook, and so on. The emotional damage there, and the way it comes home with kids, it’s terrible. It stays with them off the playground. I think that in a lot of ways, that type of bullying is even worse for kids than getting beat up. It just creates this horrifying environment for little boys and girls. They only catch a small fraction of this stuff that goes on, even today. Kids might not say anything about it at home, but it’s definitely happening. So that’s what this book is about. It’s about defending these kids from being in an environment where they are really afraid of somebody. Imagination plays such a huge role in your work. Tell me about that. I’ve always had a huge imagination. Even still, when I go to bed at night and close my eyes, I wake up the next morning and it’s like I’ve been watching a movie on the back of my eyelids for eight hours. That’s how the whole idea of Friendesha came to me. I woke up and it was fully formed in my mind. It started as a concept for a way to treat other people. It’s a gift you give someone. You reach out to them, and talk to them about their own lives, their own issues, and you listen. It’s not money, or things. It’s the extension of friendship, and caring. It morphed into a children’s book, because I was thinking so much about my Grandchildren at that time. It really is written for them. Imagination is this wonderful gift that people, especially children, are blessed with. I believe it’s the greatest tool they have to defend themselves from negativity in their lives. So imagination has led you to segue from a very pragmatic occupation, to this creative field. Have you been writing for a long time? I’ve been writing contracts for a long time! (laughs) But I always wanted to do acting or writing. I’ve written songs, hundreds of poems, too many stories. The Joe Dial was the first writing I ever published. About fifty-five years old, I decided to retire, and I’ve focused on these other things, and my family. It took me four years to write The Joe Dial. I’m not an English professor, so it took me probably seventeen tries to get it right. The kids books are easier for me, I guess. I love my kids, and my grandkids of course. I remarried years ago, so I have young children in addition to my grown kids. I call it my “second tour of duty.” (Laughs) I’m writing for all of them, and actually the characters, the Friendeshans, are all named after my children and grandchildren. If you could have parents say one thing to their children after they finish reading the story, what would it be? Most importantly of all, I would hope that parents make sure to let their children know that they can always ask, always go to their moms and dads for help. I would want them to tell their kids that no matter what happens to them at school, no matter what a bully says or does, or how mad, sad, and bad someone tries to make them feel, they never have to be afraid. There is nothing that they can’t overcome with imagination and positivity. And your message to children? The same thing. Nobody can ever say or do anything to you that will take away from who and what you are. Imagination and positive energy can overcome anything in the world.